Studies have shown that those who undergo dedicated cardiac rehabilitation focused on aerobic exercise are more capable of performing daily activities. Only 1 in 10 heart failure patients is referred to a cardiac rehabilitation program after being hospitalized, despite strong evidence that such exercise programs improve quality of life and reduce the likelihood of future hospitalizations. The findings, from a UCLA-led study, appear in the August 25 Journal of the American College of Cardiology. Researchers drew the data from a national database of more than 100,000 people with heart failure who were discharged from hospitals between 2005 and 2014 and were eligible for cardiac rehabilitation programs. “Although we expected some under-referral to cardiac rehabilitation in the heart failure population, the results of this study are startling,” said Dr. Gregg Fonarow, the study’s senior author and the Eliot Corday Chair in Cardiovascular Medicine and Science at the David Geffen School of Medicine at UCLA. “Given the individual and the public health benefits of such programs and the escalating health care expenditures related to heart failure hospitalizations, our findings point to the need for better strategies to increase physicians’ and patients’ awareness about the importance of cardiac rehabilitation,” said Fonarow, who also is director of the Ahmanson–UCLA Cardiomyopathy Center. Each year, 870,000 people in the U.S. are newly diagnosed with heart failure, a condition in which the heart is unable to pump sufficient blood and oxygen to support other organs in the body; overall, the condition affects an estimated 6 million people. Heart failure accounts for more than 1 million hospitalizations annually and more than $30 billion in direct costs. With the heart not able to pump effectively, heart failure can lead to symptoms including fatigue and shortness of breath due to the build-up of fluid and congestion in the lungs. 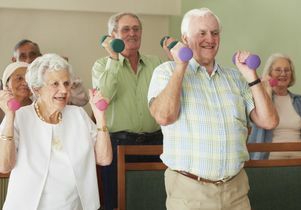 Multiple clinical trials have shown that patients who undergo a dedicated 36-week cardiac rehabilitation program focused on aerobic exercise training are more capable of controlling symptoms related to shortness of breath and are better able to perform daily activities such as walking to the grocery store and climbing stairs. After a landmark 2007 study (Heart Failure and A Controlled Trial Investigating Outcomes of Exercise Training, or HF–ACTION) showed that people who underwent exercise training following hospitalization for heart failure had an improved ability to perform normal daily living tasks, were less likely to be re-hospitalized and had a lower mortality rate, the American College of Cardiology and American Heart Association issued guidelines recommending cardiac rehabilitation for medically stable heart failure patients. In 2013, the federal Centers for Medicare and Medicaid Services approved cardiac rehabilitation for eligible patients with heart failure, making it available to a broader group of Medicare patients. The study by Fonarow’s group is the first since those guidelines were issued to assess how often physicians refer their patients to such programs upon discharge from the hospital, and the first to examine factors associated with the referrals. The researchers used data on 105,619 hospitalized heart failure patients from the national Get With The Guidelines–Heart Failure registry, part of an American Heart Association program. They found that during the period they studied, just 10.4 percent of eligible patients were referred to a cardiac rehabilitation program when they were discharged from the hospital. Although referral rates increased during the nearly decade-long study, they remained low. Patients referred for cardiac rehabilitation tended to be younger than those who weren’t, and men were referred more often than women. Patients who received referrals were also more apt to receive guideline-recommended heart failure medications when they were discharged. Equally important, according to the authors, are efforts to increase insurance coverage and reduce copayments for such programs, as well as expanding the responsibilities of home health nurses, physical therapists, and other healthcare providers to widen the scope of home- and community-based cardiac rehabilitation. The study was funded by the American Heart Association. The study’s other authors were Dr. Harsh Golwala of the University of Louisville School of Medicine; Dr. Ambarish Pandey, Christine Ju and Dr. Adrian Hernandez of the University of Texas Southwestern Medical Center; Dr. Javed Butler of Stony Brook University; Dr. Clyde Yancy of Northwestern University; and Dr. Deepak Bhatt of Brigham and Women’s Hospital Heart and Vascular Center and Harvard Medical School.